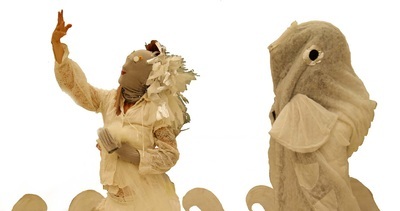 Set design, costume design, script, sound design, choreography by Karola Luettringhaus. A puppet has dreams of becoming free of her strings, of traveling the world, becoming human. She helps a fish who is trapped ona fishing line. He gives her the gift of life. This piece of transformation, dediction, compassion and the cycle of life is created for young audiences.